I feel like out of all my closet staple pieces, nothing compares to a little black dress. You just can never go wrong with it. I have a ton of LBD's in my closet. Some are dressier and some are more casual. I am more likely to hang on to a black dress for years if I like it. The main reason I like black, is because I can wear it over and over again in new ways each time. It's hard to get sick of a black dress. 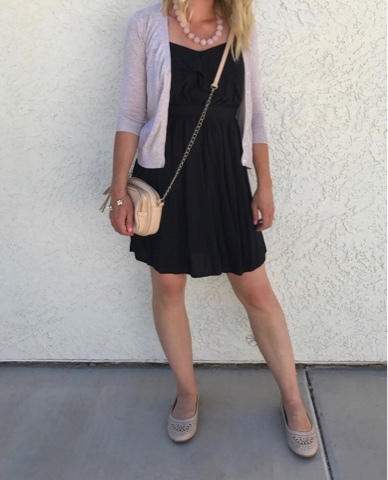 For today's posts, I picked out an older black sundress that I've had in my closet for a while. (similar here) It's from Target and I've always liked the style of this dress. It's fitted at the waist and has ruffles at the top. 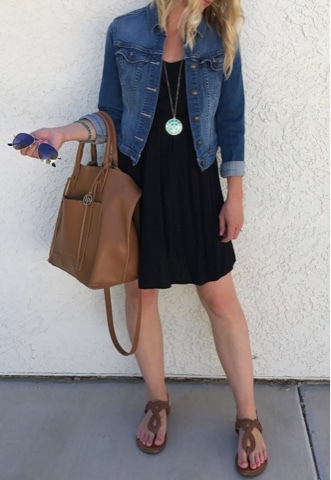 Here are 3 easy ways to style this LBD. For the first look, I dressed it up with my grey blazer and black wedge sandals. To accessorize I wore my blush purse and blush necklace. This next look is a perfect summer work look for me. I wore my tan sweater and blush flats, then accessorized with the same blush purse as above and a pink bead necklace. This last look is my go to weekend look. It's perfect to wear anywhere we go on the weekends. I wore my denim jacket with my cognac braided sandals then accessorized with my favorite turquoise pendant necklace and cognac purse. Below I picked out 8 black sundresses that I am loving right now. They are all under $25! You can't go wrong with that!